Hello lovelies, after seeing the gorgeous Kate over at Ghostparties sport a gorgeous white and gold number on her Instagram a few days ago I was craving to get some white on mine! I do find white the hardest nail varnish to pull off as it just looks messy to me on my nails, you have to be so perfect with it and I am far from it as you can see above! Also getting the right white nail varnish is vital, 'Ain't nobody got time for dat' rubbish white varnish that needs 7 layers for it to be opaque so I found the perfect polish! 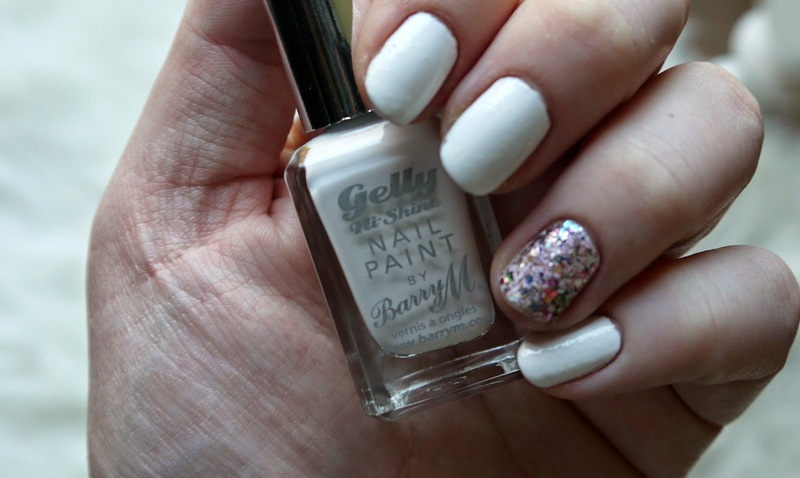 Barry M Gelly Hi Shine in Cotton is amazing, it is quite opaque with just one coat but I always do two coats to be sure, it makes your nails lovely and shiny and lasts a few days without chipping but white is renown for chipping easily as well as red and black. I didn't so much fancy the gold and have had this Loreal number in my collection for a while and not worn it so I thought this would be great for an accent nail, I love sparkly nails they are just a massive bugger at removing! I am so glad I only put the sparkles on one nail for that reason alone but how pretty is this sequin explosion? It's like my ring finger is having a party all on its own with a little disco ball full of specks of blues, pinks, purples, silver and gold. White would easily go with any other shade though if you fancied sprucing up an accent finger and white is also a great base for nail art, I miss doing more fancier nail art so I may have to start doing some more for you in the future. What do you think to my white and sequin explosion nails and what is your favourite white opaque nail polish?